The Buddha preached the blessings of monkhood and listening to that both Prajapathi Gothami and King Suddhodana attained Sotapanna stage. The Buddha discovered his wife in his lay life Yasodhara was missing in the crowd. He came to know she is residing in the balcony, and he chose to go up himself to see her. Then he preached the Sandakinduru Jataka. Listening to the Buddha, Yasodhara developed an interest to become a nun. But the Buddha had other plans. So he wanted Yasodhara to wait a little. Pajapathi's son Nanda and Yasodhara's son Rahula became monks too during this eve. These two sons, especially his own grandson Rahula was much consolation for King Suddhodana in the absence of Prince Siddhartha. He became much crestfallen. 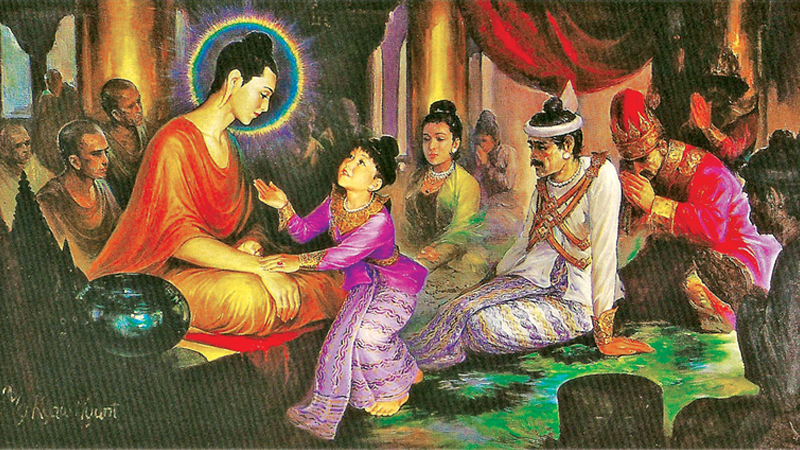 So the Buddha issued an act not to make children monks without consent of their parents. He preached Dharmapala Jataka during this event, and the King became Anagami. This was coordinated by Minister Kaludai. The Buddhas never visit their hometown without invitation. Kaludai, on the other hand, had done so much merits in previous existences so he could maintain good relationship among relatives.